Welcome to the RotoPicks.com daily fantasy site bonuses page! Here you'll find a comprehensive listing of signup bonuses that the best daily fantasy sports sites have to offer. What is a bonus? We'll explain! There are numerous daily fantasy sports websites out there to choose from. These companies know this, so in an effort to gain your business, they offer signup bonuses. This incentive usually comes in the form of free cash added to your account based on the amount of your first deposit. If a site offers you a 40% bonus up to $100, this means that they will give you a free $100 credit if you make a deposit of $250. You don't have to deposit $250 though. You can deposit $100 and get $40 free, $50 and get $20 free etc. How Bonuses Work: Unlke online sportsbooks and casinos that offer instant crediting to your account, daily fantasy sites release bonus dollars incrementally as you play in leagues. This prevents people from coming in, depositing, grabbing the bonuses, withdrawing and doing a hit and run resulting in risk free money. Also unlike sportsbooks/casinos, there is no rollover. You can withdraw your money from daily fantasy sports sites any time you like. It's 100% legal and you can request a paper check in the mail or via paypal. 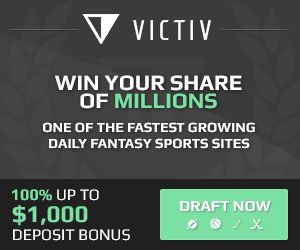 Victiv - Deposit $100 to $1000 and receive a GIANT 100% bonus! They also give you (3) chances to beat their computer generated lineup in which you win $5 per win! Draftkings - Deposit $100 to $600 and receive a generous ONE HUNDRED PERCENT bonus! Draftkings - Deposit $50 to $200 and receive a 100% bonus on your first deposit!